In this week’s episode of Soundwaves, the official podcast of SLUG Magazine, SLUG‘s Digital Content Coordinator Henry Glasheen sits down to talk with local band SubRosa about what changes 2015 brought for the band. Rebecca Vernon and Kim Pack discuss their string of European tour dates, the recording process for their new album and the concept behind their new music. SubRosa are an experimental doom metal band from Salt Lake City. Over the years they’ve released four full-length albums, with the most recent two albums being featured in multiple metal magazines and websites as milestone releases and making several year-end top album lists. SubRosa has also toured the United States and Europe extensively, most recently touring with bands like Enslaved, Yob, and Ecstatic Vision among others. 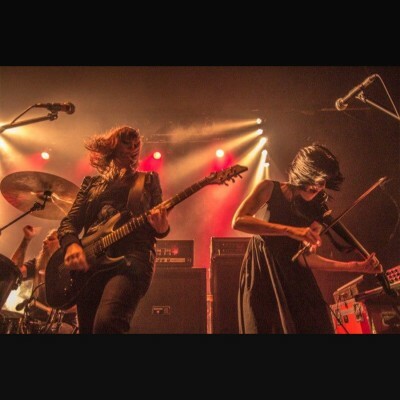 SubRosa currently consists of Rebecca Vernon on lead vocals and guitar, Sarah Pendleton and Kim Pack on violin, Levi Hanna on bass and Andy Patterson on drums, who also serves as the bands producer. This episode features tracks that the group picked themselves with explanations from the group as to why they chose each track. One track that was featured in this episode is from SubRosa’s 2013 release More Constant Than The Gods. Thanks for listening to SLUG Mag Soundwaves. For all things SLUG Magazine, visit SLUGMag.com. Send us suggestions of what you’d like to hear on the show by emailing us at soundwaves@slugmag.com. Our show’s theme was performed by Temples. Our main logo and art design by Nicholas Dowd, and the Technical Design was by Kate Colgan.